Some time in between t-zero and t-aleph-null, some time between the First Day of Creation and Judgment Day, some time in between the Big Bang and the Heat Death of the Universe, there’s a stretch of time known as always. What does juxtaposing the two statements allow us to understand? That what you tell a foreign government is not what you tell your own? That Brits are more understated and Americans more plainspoken? That President Obama is showing specific support for Israel, while Palmerston was expressing the general rule which covers all such utterances? That the word “always” doesn’t necessarily mean “for ever”, “unto the ages of ages” as the Eastern Church has it? Perhaps “for the foreseeable future” would be a better phrase to use, if it didn’t sound so iffy. I’d say it means something closer to “in continuity” than to “in perpetuity”. 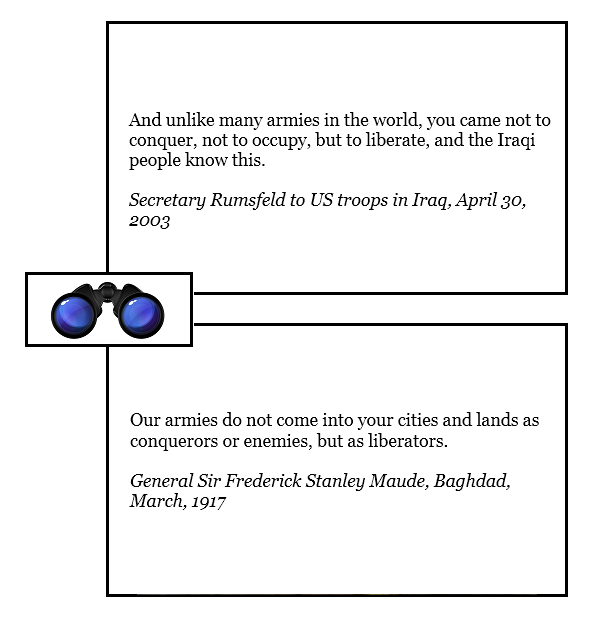 The great thing about DoubleQuotes as a form is that they jump-start you into thinking about samenesses and differences, without demanding which particular implications you will select, thus giving rise to multiple possibilities and enlarging the scope of narrative or discussion. 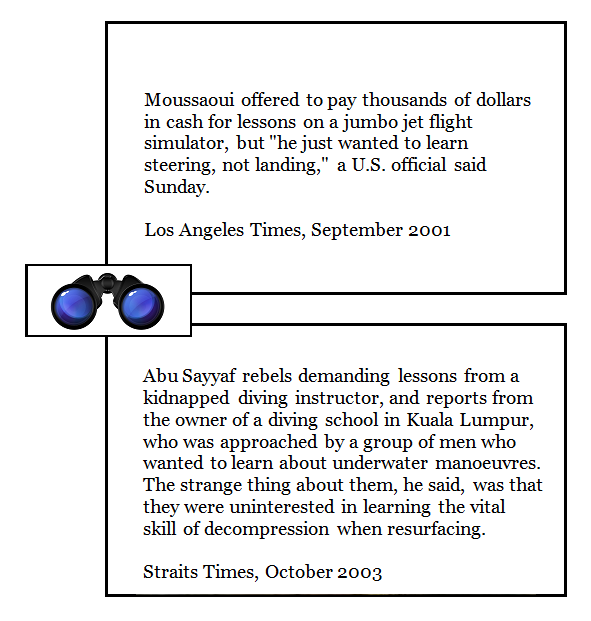 And while I’ve sharpened the pairing of quotes — or graphics — into a tool for repeated use, it’s already a habitual form of thinking, as we can see from the fact that these two particular quotes were juxtaposed by Sam Roggeveen in his post, America’s BFF: Obama calls it, in the Lowy Institute’s Interpreter today. We naturally pair similars to contrast and compare them: it may be the most basic device that human memory affords us — this reminds me of that. 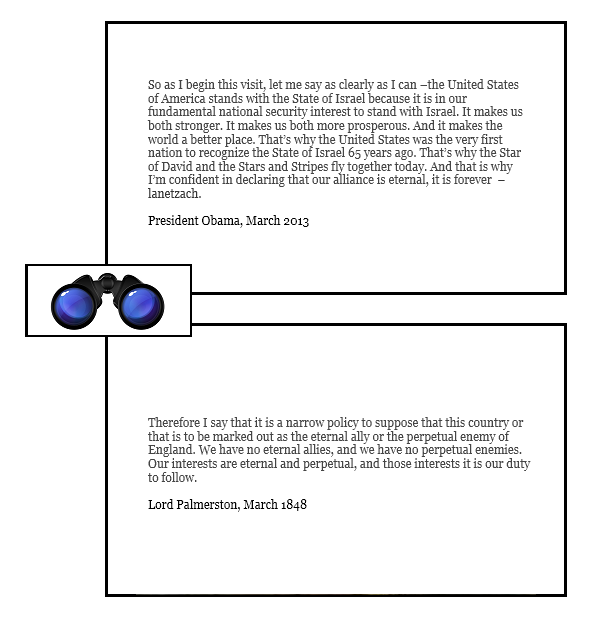 You can read Obama’s speech, from which the excerpt above was taken, on this Israel Times page. We hope to translate Hermann Hesse’s symbol of the glass bead game back into reality. Mid-way between architecture and music, forming an arch between the arts and sciences, Hesse’s imaginative game has been construed on many levels and in many ways, serving the needs of molecular biology, artificial intelligence, architecture and more. But what of its nature as a game to be played? From my point of view as a game designer, Hesse’s game is both an artwork – to be played as Bach or the blues are played – and a game – to be played as soccer or chess are played. There are a couple of things going on here that I’d like to note. 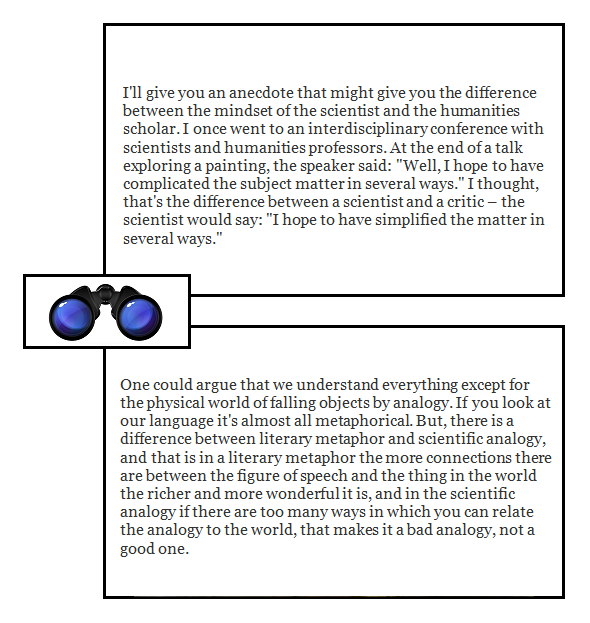 One is that without intending to do so specifically, he is in essence formulating a view about a possible, central difference between scientific and religious thinking, since what he says about the humanities in general applies with great specificity to religion and the arts: in both religion and art, the expansive nature of “symbolism” is a key to the experience. And that in turn prompts me to suggest that perhaps both the arts and religion are geared towards provoking, evoking or invoking an experience — whereas the sciences are geared towards obtaining an understanding. I’ll have to think about that, and come to some sort of understanding of my own — perhaps expressed via symbolic means. Nobody present — the interviewer, Pinker himself, and four other very bright science writers — picked up on the close correspondence between those two statements at the time. And I find that very interesting. I find it very interesting because the six of them were more interested in seeing what they could say (of what they already thought) than in saying what they could see (in light of the ongoing, immediate conversation). I think we all tend to do that — which is why David Bohm‘s approach to dialogue is so important: if brings us to speak more into the moment as it surrounds us, not quite so much from the past as it has informed us. 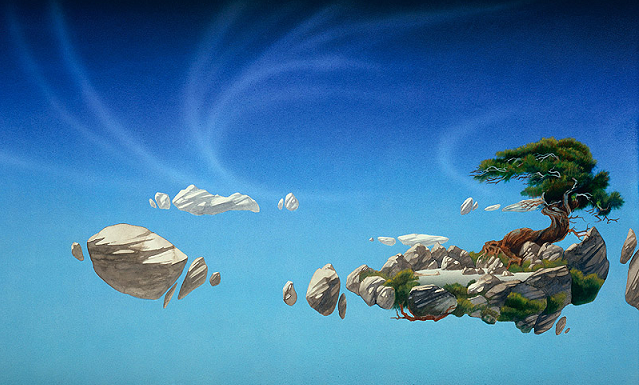 one could argue that we understand everything except for the physical world of falling objects by analogy. It’s time we learned to understand and use analogic with the same rigor we’ve applied to learning and using logic — and Sembl is just the tool for this. Experience wants to be rich: factual understanding wants to be clear. It looks very much as though I’ve been beginning to write parts of let’s call it “a book” for a while on Zenpundit. I laid out the overall topic and approach as I see it in my previous post, but here I would like to launch into it mid-stream, with a musical experiment to explore the mind’s capabilities. I’ll explain why, later. I invite you to listen to a short piece by JS Bach on YouTube. This will take roughly three and a half minutes of your time, the piece of music itself is one of the glories of the classical tradition, I’ve chosen the video because of the terrific graphics that accompany and illuminate the music, there will be some rock and ragtime to follow for those whose tastes go those ways — and I must ask you to pay very special attention while watching and listening to the video. Before you do that, however, I’d like you to take a look at the image at the top of this post, which shows you the ending of the piece both as the video graphics present it, and in the musical notation or “score” an organist would read. The graphics are terrific because they allow the untrained eye to follow the threads of the different melodies or “voices” as Bach braids them together. The work is his “Little Fugue” in G minor, which you can find indexed in his collected works as “BWV 578”. As you listen to the performance on video, I’d like you to follow the colored lines of the melodies as they move along in the video graphic, and listen carefully to hear how many of the lines of sound you can actually follow distinctly in your mind. At the beginning there’s only one “voice” – only one line of melody – so your task is easy. If you are used to listening to music of one sort or another, you’ll almost certainly be able to track, more or less, some kind of thumping bass line and some kind of melody rising above it – two voices. Can you manage three? four or more? 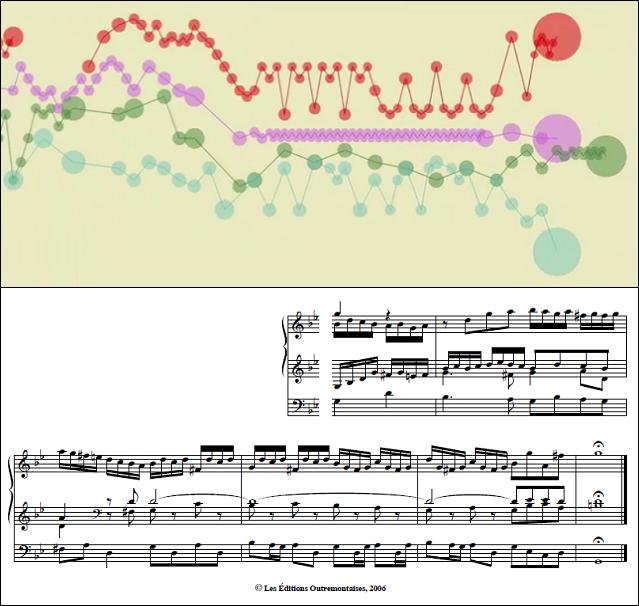 If you’re a musician you may still find the graphics — and the exercise – illuminating, but you might prefer to make the same experiment with a version of the piece played by Robert Köbler on a Silbemann organ, accompanied on video by the score..
How did you do? How many voices could you follow at one time? And why am I bothering to as you to do this, and then talking so much about it? After all, you may already know everything I’m saying and more, or you may simply not care that much about such things. Here’s why: the project is about creativity and intelligence. It’s about how to apply forms of creativity that are generally found in the arts and humanities — and in the world’s contemplative traditions — to the questions that arise for every bright human as we face the exhilarating challenging and terrifyingly complex world around us. It’s about understanding complexity, in the way the Intelligence Community needs to understand complexity, and business leadership, and our scientists and technicians, and the congregants at our synagogues, churches, mosques and temples, and, well, all the bright people everywhere — disillusioned, or fresh and rarin’ to go. Complex problems often require some sort of recognition and resolution of several or many distinct and sometimes conflicting voices, points of view, concerns or vectors.. which may shift in intensity and direction as the situation evolves. In musical terminology, any music that includes two or more distinct melodic lines or “voices” playing together simultaneously is polyphonic — from the Greek for “many voices”. Counterpoint — from the Latin for a point that counters another point — is the artful way in which composers can “work” two or more melodic lines together, so they clash at times, resolve, and harmonize. The fugue — the particular contrapuntal form Bach uses in the piece you just heard — imposes even tighter constraints on the composer, and can elicit even greater creative inspiration as a result — as many of Bach’s, Mozart‘s, Beethoven‘s and others’ greatest works testify.. I imagine you can see that the many voices of polyphony — voices in counterpoint, that at times clash and are in need of resolution and harmony — have their equivalents in the complex multi-stakeholder problems, clashing points of view and need for constructive resolutions that creative artists, intelligence analysts, strategy, policy and decision makers, and anyone who wants to keep aware of the shifting currents of our strange and complicated times all need to take into account. When you think about it, when you think about Jew and Palestinian not separately, but as part of a symphony, there is something magnificently imposing about it. A very rich, also very tragic, also in many ways desperate history of extremes — opposites in the Hegelian sense — that is yet to receive its due. So what you are faced with is a kind of sublime grandeur of a series of tragedies, of losses, of sacrifices, of pain that would take the brain of a Bach to figure out. and which we need to supplement, if we are to have the mental flexibility to see and make the creative leaps our times require of us. For more on this, see also my Feb 2011 post (at least I’m reasonably consistent over time) A HipBone approach to analysis VI: from Cairo to Bach. God only knows how many voices there are in Bob Dylan‘s song Sad Eyed Lady of the Lowlands, or Eric Clapton‘s Have you ever loved a woman from the 2004 Crossroads Guitar Festival – the principle’s the same, but we don’t (yet) have the graphics to allow your eye to follow what the musicians are doing — and there are solos, and sidemen. Each musician has at least one voice, its melodies and its silences, to present – and sometimes several, as we saw with the Bach organ piece. And together the individual musicians add up to an ensemble, each with an awareness of the others’ voices and a concentration on their own. And for an insight into the varieties of organ mastery, compare Billy Preston‘s amazing solo starting at 9’33” on the Clapton piece, Al Kooper‘s organ work on Dylan’s Sad Eyed Lady, and Ton Koopman‘s rendering of the same Little Fugue BWV 578 we started with – where at times you can watch Koopman’s fingers on the keys or feet on the pedals, for yet another way of visualizing the intricate interweavings of this glorious music. 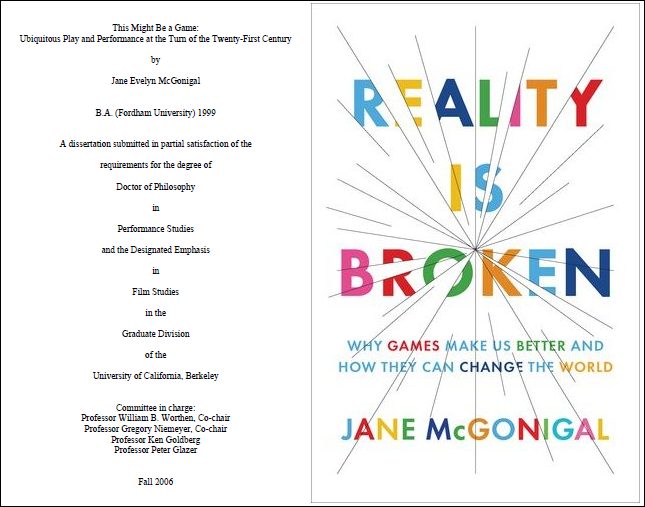 I’m joining the conversation Jane McGonigal is leading over on Big Questions Online — our topic is How Might Video Games Be Good for Us? — and she came up with a gem of a quote from Huizinga‘s Homo Ludens which pointed me to two other quotes that are part of the collection I keep in mind, one from Wittgenstein, the other from Roger Caillois. There’s more to those three quotes taken together, along with the leaps between them, than there is in keeping them apart. They have, what was it Wittgenstein said? — a family resemblance. They belong together. 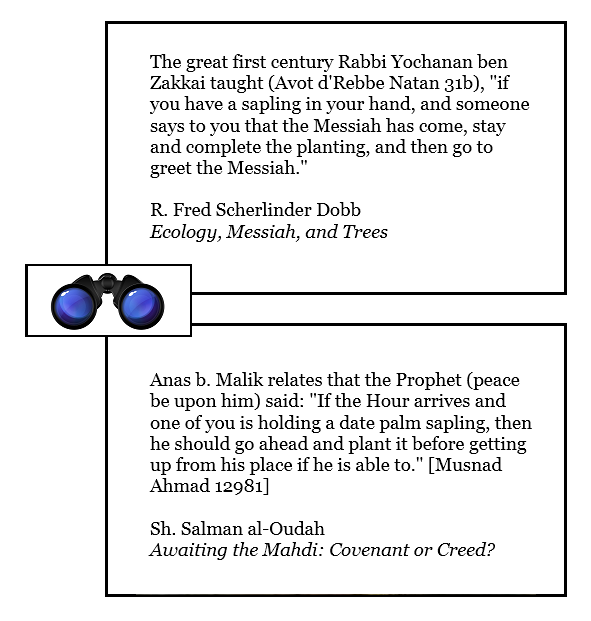 You could start with the third quote, in fact, and then hop to the first and second, and the effect would be much the same, you could make a ring of them. They spiral so closely in on one another, indeed, as to induce ilynx, vertigo. Let’s keep on spinning. Blam! — is there anything more vertiginous than paradox, enigma, koan, mystery? In perspective, there’s the vanishing point. In service to others, there’s forgetfulness of self. Serio ludere was a Socratic maxim of Cusanus, Ficino, Pico, Calcagnini — not to mention Bocchi, who introduced the very phrase into the title of his Symbolicae quaestiones: ‘quas serio ludebat’. Pseudo-Egyptian hieroglyphics, emblems and impresae were wonderfully suited to the playful spirit of Florentine Platonism, to the mysterious and “mystifying” quality Ficino believed it had. “Pythagoras, Socrates, and Plato had the habit of hiding all divine mysteries behind the veil of figurative language to protect their wisdom modestly from the Sophist’s boastfulness, of joking seriously and playing assiduously, iocari serio et studiosissime ludere.”  That famous turn of phrase of Ficino’s — translation of a remark by Xenophon concerning the Socratic method — depicts, at bottom, the quintessence of every phantasmic process, whether it be Eros, the Art of Memory, magic, or alchemy — the ludus puerorum, preeminently a game for children. What, indeed, are we doing in any of the above if not playing with phantasms, trying to keep up with their game, which the benevolent unconscious sets up for us? Now, it is not easy to play a game whose rules are not known ahead of time. We must apply ourselves seriously, assiduously, to try and understand and learn them so that the disclosures made to us may not remain unanswered by us. [34.] Proem. in Platonis Parmenidem (Opera, II, p. 1137). This is simply the Latin translation of an expression Xenophon had used to designate the Socratic method (paizein spoude). On the custom of the “serious games” of Ficino and his contemporaries, see Edgar Wind, Pagan Mysteries in the Renaissance 3d ed. (Oxford, 1980), pp. 236-38. Okay, I was trying to check a Latin tag that I’d obviously been quoting from memory, and things just kept on spinning — and weaving — together. The dissertation is available here as a .pdf: the book is available here on Amazon. According to 25 Years of Super Mario Bros: A Look Back Through Mushroom Kingdom History, from which I grabbed the Mario Bros portion of the graphic at the foot of this page, “Since 1985’s release of the second-most selling console game of all-time, over 200 Nintendo titles have featured the eponymous Mario Bros” — on which I’ve played perhaps three or four levels of one or two early versions. The Super Mario Bros side-scrollers (image above, left) are the work of the brilliant Shigeru Miyamoto, and part of what I find so fascinating about them is the way in which they resemble the mind-blowing practice known as Parcours (image, right), which apparently developed from the work of one David Belle, born in 1973 — who would have been 12 when the first Super Mario Bros game came out. Let’s take a look at Super Mario Bros and Parcours, and then move on to the issue of parcours for the adventuring mind. My own question is: what would a mental parcours game look like? Let’s just say Lumosity seems to have a variety of cognitive skills well in hand, which leaves me free once again to concentrate on what Derek calls the mind’s opposable thumb. That’s a brilliant concept, I think, and gets to the heart of what we’re working on with Sembl. The various other conceptual skills that essentially add up to linear thinking — Mark Safranski of Zenpundit calls it vertical thinking, see this helpful diagram — are important, and well-studied. They work best where what you are talking about is quantifiable and amenable to logic and cause and effect analysis, and is explored within fields, not across them. Context, quality, complexity, systems, dynamics, process, simplicity, value, passion, poetry – these are the things linear thinking has problems with. Poetry, passion, value, simplicity, process, dynamics, systems, complexity, quality, context – these are the things horizontal thinking does best. I’d like to turn our focus here to the Glass Bead Game as Hesse describes it in his novel, Magister Ludi, and in particular to the range of play, and the nature of moves: putting that in game designer’s terms, I’d like to talk about the gameplay as Hesse envisions it. 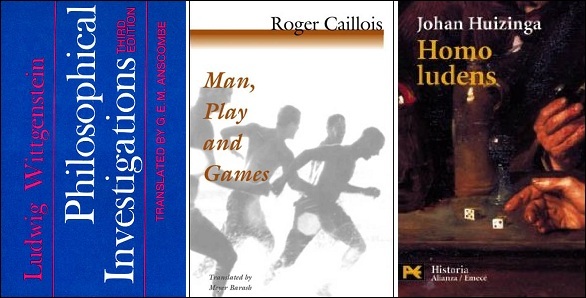 That’s the range of cultural themes that Hesse’s game players are playing with. But what kinds of moves do they make with them? At one point, he gives as an example the discovery of “the most striking congruences” between “the rhythmic structure of Julius Caesar’s Latin” on the one hand, and “the results of well-known studies of the intervals in Byzantine hymns” on the other. And this is by no means as far fetched as it might at first seem. In 1978, the University of Wisconsin Press published volume 9 in their “Literary Monographs” – a book by Jane-Marie Luecke OSB entitled Measuring Old English Rhythm: an Application of the Principles of Gregorian Chant Rhythm to the Meter of Beowulf (see this review in Speculum). How do our own concepts of a playable version of the Glass Bead Game embody these ideas? Some time in the mid to late 1990s, I raised this question on the Magister-L mailing list with six or seven friends who had designed Glass Bead Game variants, and proposed a specific, particular juxtaposition of two parallel “cultural themes” to them, asking how their game variants would handle a move that made this particular linkage. Two friends with particularly intricate GBG variants — one involving the development and use of a “constructed language” and the other a skillful blending of chess and I Ching — responded, and the ways in which they would handle a move linking these two themes in their own games can be found at A GBG Test Case Move: Mark Line’s Game and William Horden’s Intrachange. I think it’s fairly clear from these six examples that this “test move” can do a pretty good job of helping us see how a Glass Bead Game move would work in practice, in a wide range of possible GBG implementations – and I’d like to present it again here, fifteen or so years later, to see what ideas it might elicit this time around. Here, then, is the Test Case – the “case” being the two themes to be juxtaposed, and the “test” being how each individual would tackle the job of playing these two moves within their own concept of the GBG. Michael Ventura has a very interesting observation in the wonderful essay Hear that Long Snake Moan which can be found in his book, Shadow Dancing in the USA. His insight is based on the idea that Dixieland jazz emerges from Voodoo seances in New Orleans: at a time when voodoo was strongly prohibited, the drums of the sacred dance continued to beat as the drums of the secular — and that when the drumming reached such a pitch that in voodoo one of the dancers would become possessed by a loa, in jazz a soloist would take flight. In Ventura’s view, the relationship between ensemble dancing and the emergence of individual trance in voodoo, and ensemble playing and the emergence of the solo in jazz is not merely a fortuitous and close parallelism, but the direct translation of the moment of ecstatic breakthrough from one medium to the other. in your game, would this move be possible? if so, how would it be notated? if not directly, is there a move in your game which would capture the essence or the structure implicit in this move? if not, then what example can you give me of the kind of move that would be possible in your game? and how would this sample move be notated? 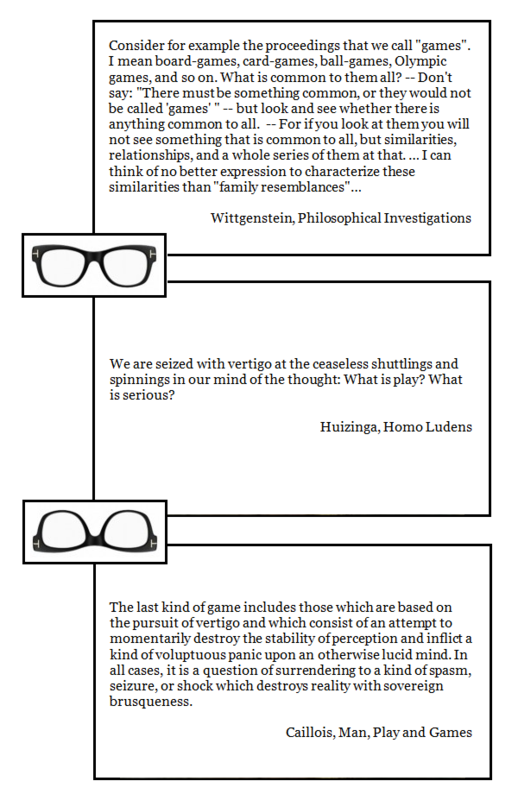 In asking these questions, I don’t wish to imply in any way that games which can include this move are superior or inferior in kind to those which cannot: my purpose is simply to clarify what kinds of move are possible in each of our games — or would be possible in each of our approaches. And I should perhaps add that there are other aspects to Hesse’s game that I am not attempting to capture here — notably the use of glyphic beads, so well illustrated in Joshua Fost‘s Towards the Bead Game variant. Some of the most obvious things aren’t obvious at all, until you think of them. The things my friend Derek Robinson talks about as being in the beforeground. Too close to notice / right under our noses all along. IMO, we need some funding sources that understand that the next significant breakthrough, too, will be all but invisible — and who therefore look specifically for projects that are categorized by their radical rethinking of the seemingly known and obvious. 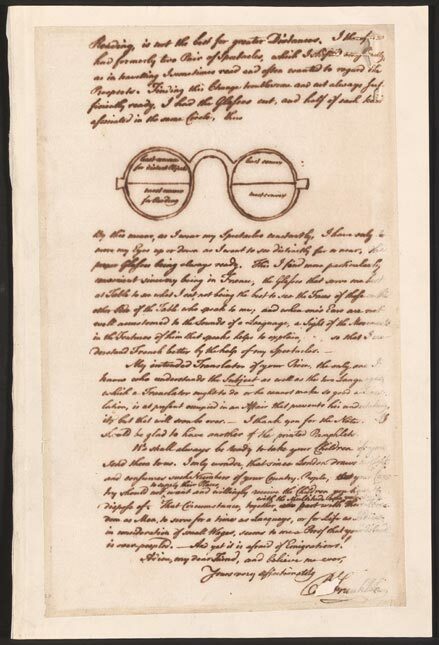 For anyone who’s curious, the bifocals pictured in the tiny “specs” section of my graphic above come from Ben Franklin‘s original letter proposing the idea of bifocal glasses, courtesy of the Library of Congress (link is to complete image). 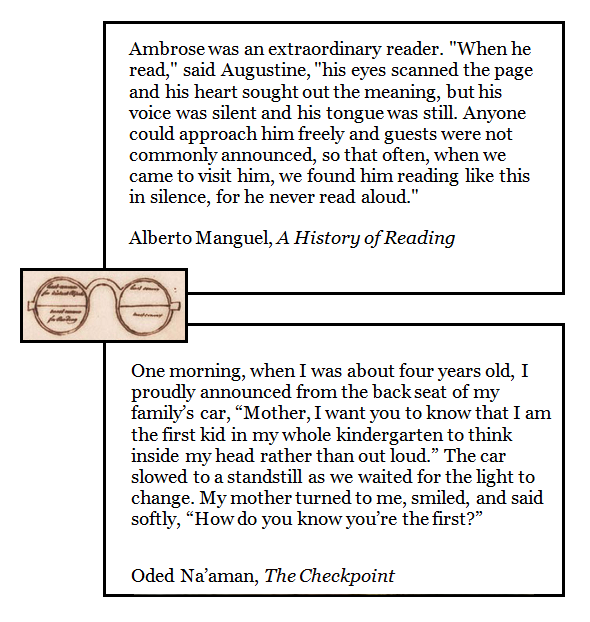 The Odel Na’aman story, The Checkpoint: Terror, Power, and Cruelty is up at the Boston Review site. I haven’t read it yet, just tasted the first paragraph.